Kemper Profiling Amp reaches the parts other amps cannot reach. Should you consider one of these? Where do we start with this really groundbreaking product? Firstly here's a short introduction I wrote recently about the Kemper Profiling Amplifier for guitar. Then we'll get right on after that with the full review of inside, outside - the whole deal. I have some really good vibes about this one and it's generally affordable. Hmmm... most of the devices I have seen over the years which simulate or emulate tube amps usually fall short in one way or another. Some makers will claim frankly ridiculous things about how theirs is better than the rest or something along those lines. Indeed there are some these days that even promote the idea that two processors are better than one - but in reality, its not the processors that make a better sound - its actually the programming to make those processors work that could (but not necessarily) improve the sounds. Some claim that the 'best' and perfect sounds in the world have been 'improved'. Difficult if they were already the best and perfect don't you think? I think so too. Well over the years many companies have tried and wanted to be the king of the simulators/emulators pile simply because of the massive market place of eager buyers waiting for all those promises made in all the hype over time to come to fruition. The dream usually goes something like this: 'Now get all those amps in one unit and get rid of those heavy tube amps - we've made them all redundant. Sell your tube amps and be done with that old technology'. Unfortunately its not quite true in the real world is it? Firstly no one would be buying tube amps? right? but they still are buying them all over the world in their thousands upon thousands and will probably continue to do so for a long time to come. So maybe something is 'missing' from the equation which offers everything in the form of a piece of silicone (rather like some other things made of silicone out there) for usually not too much money, but sometimes they actually do cost of a small fortune and none really deliver in the same way a real tube amp does. At last things are about to change much to the chagrin of many manufacturers - and not just the tube amp makers either - some of those other brands of simulators/emulators may well be quaking in their shoes. And rightly so. They should. Why? Enter the Kemper PROFILING Amp. Now lets get one thing straight from the outset... this is NOT another emulator/simulator/I've got more power than you product. No sir, this amp uses a different methodology altogether thankfully. The manufacturer (already around for about 15 years or more in manufacturing and the maker of the Virus Synth) has developed an amplifier (actually a preamp) that can literally profile any other amplifier and speakers in the world today and in a faster time than you can shake a stick at it. It has been a while coming to market, but it is here right now for you to go and buy. Now REALLY this is a new approach to moving forward with guitar tube amp sounds. Simply profile all and any amps you have, with your favorite sounds and/or cabs, or swap profiles with others on the internet via website, emails or other sources and you have a lightweight, relatively low cost (half the price in Europe of some other makers we could name of simulators/emulators) and a completely easily transportable unit hardly bigger than a small tool box. Does all that sound familiar? You're darn right it does. Its where we started talking about simulators/emulators and all those promises back up the page and over the last umpteen years. Now listen up... there are many people who know I like tube amps. Many other guys like them too. Sure enough I have enough of them. But I have continuously kept on checking those simulators/emulators of tube amplifiers to see if there are any that in my opinion actually did the job of sounding exactly like (and feel like) a real tube amp. I never found one that could literally do it exactly with all those nuances of the sound and that 'feel' that real tube amps offer. And the Kemper amp (also called a profiler) does it in a way that really is different and not just some revamp of all the other guys out there. In fact its so different that the Kemper profiling amp might just revolutionize the amplifier industry. Sure there will be guys like me who will not sell their tube amps (notice I did not say never) and maybe those guys really like those tubes to warm up the studio. The digital stuff, no matter what brand, does not do that (and probably never will unless its burning out). But you know what, maybe by this version or version two of the Kemper amp those sounds will make me or you want to sell those tube amps and then it all might be a different story. I believe tube amps still have a great and leading role to play where guitars are concerned of that there is no doubt, but believe me, this Kemper Profiling amp is set to change the way you think about amplifiers based on silicone. I don't see Marshall going out of business any time soon or Engl, or Mesa Boogie or any of those other great brands of tube amps, but on the same note, this profiler technology will improve and as I write (January 1st 2012) the Kemper Amp REALLY does deliver on near enough all of what the designers set out to achieve. An amp that can copy the exact sounds of a great tube amp or amps and speakers (or even not so great ones) and replicate that sound exactly to what the profiler input of the Kemper amp hears out of those speakers of the real deal. The Kemper profiling amp is actually a preamp as I said, but the Manufacturer has even designed a space for an output amplifier right in the case assembly around the back of the unit (what a great idea) and indeed the power amp can be bought from them and added so you end up with a complete preamp and power amplifier completely matched and ready to go. While the visual design of the amp is in no way profiled from any tube amp I know of, the sounds that come out really are! So check out that Kemper profiling amp below in my review because it really is different - it offers in a very large way exactly what you have been looking for over many years. Now that's real news! And remember I buy every single piece of equipment just as you would! There are no favor's for me - just like you really. Why am I different than you? I'm not. So its likely that my views would be similar to yours if you just bought one of these. It's not too often that I might get excited about some emulator type of product.. let's face it head on - they near enough all sound a little like a cheap Chinese radio, especially if you have been used to the sort of tube amps that I have. 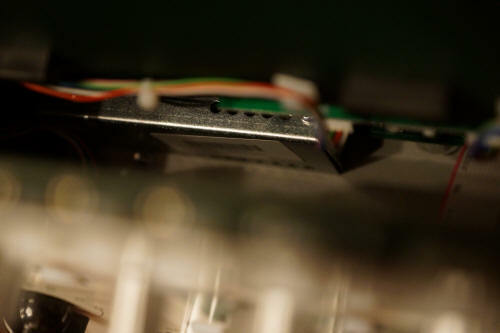 If you have only ever used those emulators then clearly you are missing out somewhere down the line - they NEVER sound the same as the real deal, let alone 'feel' like a tube amp when you play it. But this Kemper Pre Amplifier is different. I cannot say its the first emulator type product to use profiling... that was another company who sneaked in and 'added' the facility to their OS before Mr. Kemper got this product released. But don't worry too much about that - the other one has absolutely no comparison with this one under review and in my opinion the other one is inferior. So let's start off with this Kemper Profiling Amplifier and see how its made. 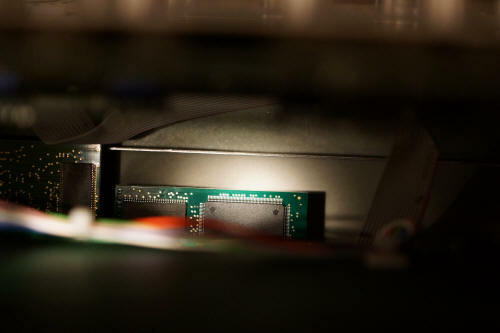 Ram memory on a PCB and processing on a board at the bottom of the unit. 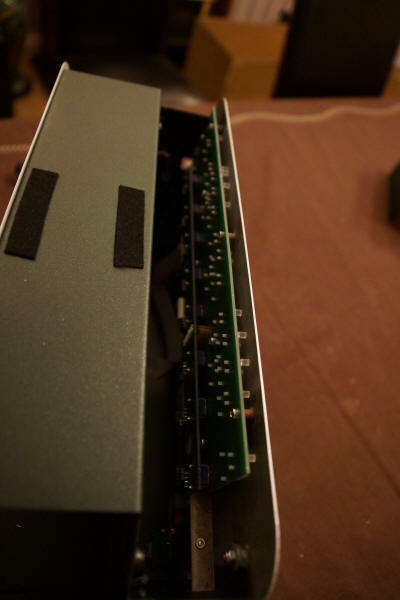 Somehow, even after removing the screws nothing came apart, and I did not want to strip MY Kemper amp further. Now then, there is obviously much more technology bits and pieces that I can even get near to, but on this occasion like I said, I failed. Just because you don't see them don't assume they are not within this amp. But don't worry. This is not some technology product that boasts about two or more processors, or indeed something that it is not. This is a Kemper Amp so forget everything you think you know about this technology if you have not actually used one. The rest of the build was impeccable with that German engineering shining through at every point on the build. In fact, I could not actually find one thing that was not as it should be. And that's the point really, as you will see later down the review the Kemper does exactly what they say it does without all that hoo-hah about specifications and the like. Strong, Simple, Sophisticated results and all without a massive price tag as some other gear carries. So I bolted it all back together (you might check my video pages for the video review of this amp - there's video of the inside as well as real time profiling and more) and decided that for the time being it really did not matter, and you know what, I was exactly correct - it does not matter what's in this box, it just does it all - as you will see later. Looking at the Kemper Amp you will notice that in actuality it's not really that big. It's not that heavy either, but it does include a real leather strap as shown of the highest quality. What is useful is how easy the Kemper Profiling Amplifier is for portability, and when that power amp arrives (which Kemper is working on) then this unit will be a no brainer for anyone who wants extreme portability AND flexibility of sounds. Looking at the front of this amp makes you think that its some kind of geeks sandwich box. While there is no doubt that the amp is in no way a resemblance of any other amp in the world, and that the looks alone could defer you from buying one that might just be a mistake on your part. A nice 100 to 240V Power input - again nice to see so you can take it worldwide. But please note that the Microphone in DOES NOT SUPPORT A PHANTOM POWER OF 48V. In fact there's no phantom power of any kind for a microphone. That appears to be the only real thing I would have liked on there and the cost would have been minimal. After looking at many brands of product that you could say 'broadly' fit in to similarity (in actuality there are none) most of those other products have a manual as thick as your wrist. It's a known fact that many guitarists are completely turned off by all of that stuff. Let's be clear, a 6 hour read of the manual is not most peoples idea of fun unless you are one of those geeks. And if you are? Don't buy this amp, you might run out of things to read or play with after just 10 minutes. The Kemper manual is shall we say, light. And that's a good thing. Whether you are looking at the intro manual or the 'reference' manual none of it would bother you. 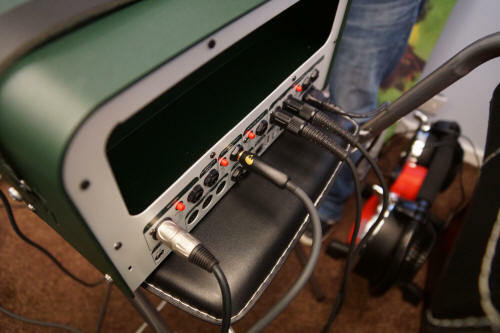 In fact this Kemper Profiler is so good that you hardly need to refer to the manual at all. Now that's a really nice change and it sort of reminds me of a manual you might find with a well known brand of tube amp. Just the simplistic and understandable answers you need and no more. It's also nice to see a product that is manufactured with CE and RoHS approvals with all the other good stuff that should be there by default. It's probably because the manufacturer is European and is well versed with the law in Europe. It would have been nice to see those profiles listed in the manual for reference purposes at least, but the manual I had received (with the first shipment) is probably due an update. Your manual may well include more, but I'm sure the Kemper guys will keep it all very simplistic - the way it really should be, and in this case, is. Clarity: Basically this can 'focus' on the cleaner aspect of a tone without actually lowering the distortion! Tube Bias: You should be familiar with this if you play tube amps. High bias equals early tube distortion and low bias is the opposite effect. While the above looks daunting in fact you don't really have to change anything. And that's the best kept secret of the Kemper Profiling Amp. Check out my video as we profile and we change NOTHING - but the result is so near that the guitarist playing could not actually tell you which was the profile and which was the real amp with any certainty whatsoever. Now that's a cool idea. When you have profiled the amp, set everything as you want it, you can save it all effectively as a 'rig' including any settings, cabs, etc. to one save. And what's great is that when you reload the rig you can see immediately what is on or off (even across the stage) from the face of the amp. Nice. Needless to say, this amp has lots of 'types' of effects. For example there are (at time of writing) at least SIX types of wah. Check out the Distortion stomp boxes and there are seven types covering all the ones you have grown to like over the years such as 'green scream' (go on, guess which one it is), 'Muffin' (another guess) and so on. For modulation there's SIX types including a 'rotary speaker' which is one of my favorite 'Hendrix' effects or maybe you like Robin Trower? I do too. There are 5 types of EQ, and three types of delay including tap, free and analog and we're sure there are more. But you know what, I could not be bothered to spend hours trying them all out there is simply too many. The examples of profiles as supplied does that to a large extent for you. Plug in and play! There are other aspects to the amp such as external switches to control external stuff, but I'm skipping that for now - there's enough of that sort of thing on the internet already. I'm just interested in the overall thing and don't really want to be to the extremes that some go to, or you could be reading this review for weeks! It's a pretty standard midi implementation that you see on many amps these days and it's possible to store up to 128 MIDI program change numbers to rigs stored in there. Then it's a simple matter of setting up the MIDI pedal to choose which rigs you need. There are other things that you might be able to do too. I will be reviewing the G-Lab GSC-3 MIDI foot controller presently with both this Kemper amp and maybe the Engl E670. 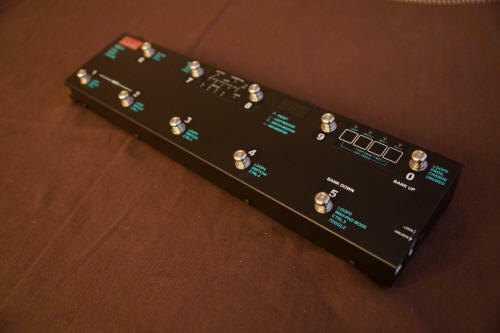 That unit can switch up to 6 external loops (with effects or amps) in and out with 100 memories for all the switching. It should be interesting. I am waiting however, for the MIDI implementation documents to be published before I try that. The G-Lab GSC-3 Midi controller. But theres a newer Kemper controller around these days so watch for that featured somewhere lower down in this review and indeed some other very useful things that I have worked on Kemper rack amps. Please note that Kemper now have their own floor controller pedal called the Remote pedal which is reviewed on this site under the accessories section. The remote is far more useful with a Kemper amp than any midi pedal. The list could literally go on and on. So that's a really good reason to stop. Think of it this way, no matter what your story is, it's likely that the Kemper will integrate exactly as you want it to. There are many I/O choices (see above) and the combinations are actually almost seemingly endless. As well as all that, Kemper themselves are bringing out a POWER AMPLIFIER that can sit in that black hole around the back of the preamplifier so that you can actually turn the Kemper Profiling Amp in to a real and complete amp. Then you can simply plug it on to your speakers and play. Now that REALLY moves on the level of integration. I cannot confirm this, but it's likely that Kemper will develop a transistorized product with very flat response curves to work perfectly with the Kemper Amp (the preamp we are discussing here). Now that's one thing that the others out there have not done and probably a first for this style of technology. Personally I just bought a Behringer 1u amp and sit that on the speaker cab - it's cheap, a PA amp so its flat response and small enough to fit under the Kemper preamp. By the way, the Kemper Amp comes with HUNDREDS of profiles professionally captured and installed when you receive the amp. It was extremely encouraging when I tried these profiles - there was just ONE profile that I though would not be used regularly by guitarists. Now if you compare that with other kit (I've seen some with as few as 10 or so that you would use and the rest were 'filler' for the memory) then the Kemper makes absolute and perfect sense. Every ones a winner baby that's for sure. For this review we decided to 'profile' a Divided by 13 FTR 37 - a known top of the line tube amp, and I asked my friend Dan to come along because two hands are better than one. Following the review we did of his amp we set it all up with an SM57 microphone to capture that profile, so I could have his amp for free. It was a little disappointing not to be able to power my microphones that needed 48 volts phantom power, but that was the only disappointment during the whole experience of the Kemper amp. We connected the Kemper to the power amp return, put the SM57 in front of the custom Divided by 13 speakers and fed the outputs of the kemper to the Yamaha O2R96 desk. It took less than ten minutes and was only that long because I had to find a few cables. To recap from earlier in this review: The wiring for the review. Left Mic, second amp feed and last 2 x desk feed. 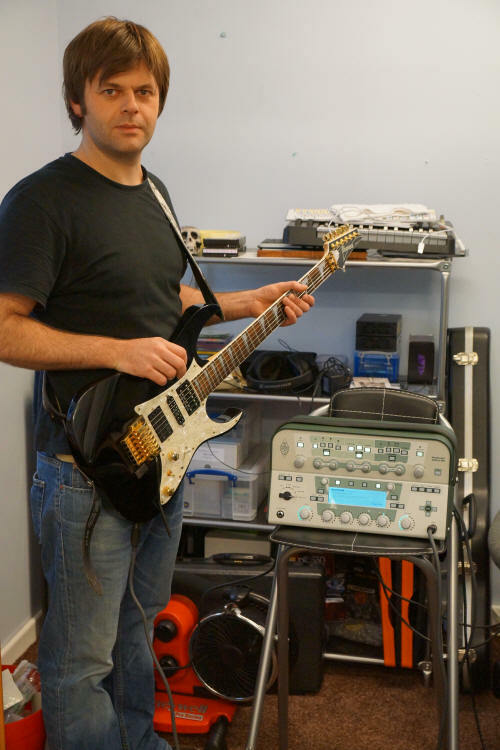 The setting up of the guitar to the Kemper took about 30 seconds and we were ready to profile our first amp. It is actually on the video! That's right, this was our very first profile and we didn't look at the manual once. Capturing the profile was simple and took less than 5 minutes in total (one reason why the Kemper Video is shorter than some of my other video reviews. While the sound did sound 'similar' both myself and 'Dan' my assistant could hear a difference between the Kemper amp and the original Divided by 13 FTR 37 amp. From there it is possible to 'refine' the profile, so that's what we did next. It's a simple matter of choosing the 'refine' button and getting the guitar player to play chords as hard as he can through the amp. That took less than a minute. THE RESULTS WERE ASTOUNDING AND INCONCEIVEABLE! Yes really. I had Dan play for a while and then did a 'blind test' between the two amplifiers. Actually I chose firstly the kemper twice and Dan thought that the first one was the Kemper and the second one was the original. He did get some right, but when questioned, he did admit that he really could not tell the difference and was not at all sure which was which. You would NEVER believe that the Kemper amp can actually do what this one did in the studio and I can tell you it was about 99% there right from the profile without any messing about with any of 500 parameters like some kit has to. There it was, in all it's glory - this thing really did deliver the goods - and at this price (£1170.00 in the UK) it is an awesome thing to behold. I cannot really express in words exactly how good this Kemper Amplifier really is. Yes its that good. And if we had spent another couple of minutes on this profile it would have been exact - and I mean exact, not similar. One more thing I just want to mention is the profiles themselves. These are small files and can be emailed to someone else. Now that opens up a massive potential that the other stuff out there simply does not address in this way. Over time, can you really imagine how many profiles you can accumulate and from which amps. The mind boggles at this sort of potential - and all because this thing sounds so damn good. And Kemper have a very powerful control over their forum so that users are not bullied and abused in any way. Actually it's completely commendable and the way a forum should be operated. You might well need to go there for questions you might have over time, although Kemper themselves will support you directly if necessary. So if you don't like forums it makes no difference, you don't have to like forums when you own a Kemper. While I have not covered every last aspect of the Kemper Profiler in this review, I just wanted to get across to you that this amp is probably the first in the world to go where no other digital amp has ever done, at a price that is exceptional (for the results) and is flexible enough to meet the needs of many musicians. Of course, it's only my view, but I suspect that if you were to do what we did in the review and video then you would be as impressed as I am about this unit. And I only disliked no phantom power for the microphone. There was little to be honest to dislike - even Thomann delivered fast and free. As most regular readers will know, I often rate the equipment from 1 to 10 - 1 being exceptionally bad and 10 being perfect. It's not often that I see any piece of kit rise above an 8 out of 10 because of this, or because of that, or even sometimes simply the overall price. 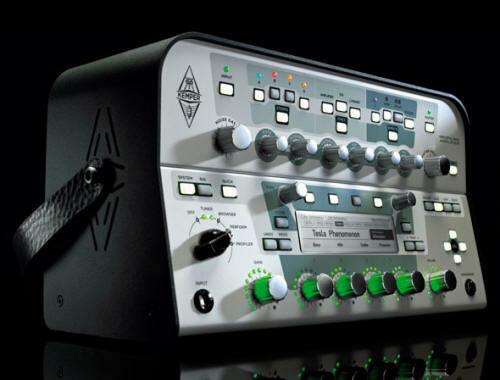 But this Kemper Amplifier I rate at 10 out of 10. There's just a small number of musical equipment that falls in that elite sector of greatness, and the Kemper amp is one of those products. There's no one reason, it's the whole package, the kit, the supplier, Kemper themselves and much more. So that should really get you interested in the Kemper profiling Amplifier. I have missed out lots of stuff in this review, and maybe even made some simple mistakes (I can, I'm just like you), but usually my experiences with the kit might well be your experiences with the kit too. Think about that, and the times you have bought kit over and over where some manufacturers say it is great, but in reality the kit falls short in one way or another. I bought this Kemper Amp for Thomann price (just like you would) I plugged it in, profiled a good amp, and was amazed - just like you will be too. So either go and try one, or buy one now - it's the best thing I've seen for a while and I recommend it completely. I have had many communications with guys who want to know how to use various amps with the Kemper preamp. While it is perfectly feasible to use almost any power amp with the Kemper clearly there are some amps more suited to the Kemper than others. When I bought the Kemper I was under no allusions to exactly what I might need even though I do have a large array of tube amps. Kemper will tell you that the amp works with PA systems and recording desks and of course other amplifiers. But I wanted to get a 'stereo' thing going particularly because some of those effects are stereo and they should rather good that way. So what did I do? Actually I did what many guys might do, I simply bought a low cost PA amp (in my case a Behringer stereo amp) that has a pretty flat response and used that. The next problem was of course the speaker cab. I had a very nice Marshall Vintage Modern 4x12 cab that has a stereo option on the inputs, so I switched the cab to that, put the power amp on the top and the Kemper preamp on the top of that. You could of course use different power and speaker cabs than me. A photo of the Kemper with a Behringer 2U Power Amp in to a Marshall Vintage Modern Cab. It worked for me. As you can see I could have installed a rack case for the Behringer, but these were the first test setup's I completed with this lineup. Heres another shot of the wiring - it's simple enough stuff. Of course it's a simple setup. And that's exactly what you want, no messing about, no fiddling with menu's for an hour trying to get the output where you need it and utilizing (where possible) equipment you might already have. Plug in and go. I could have used a Behringer 1U PA amp at even lower cost, but this one was about £175.00 from Thomann in Europe. Expect to pay less in the USA and more in outer Mongolia. What did it sound like with this setup I hear you ask? Well actually it sounds extremely good. Those effects make this amp sound even better and it's possible to even have sounds that the original amp could not achieve. I tried at the time my favorite amp profile - one of the ones loaded when you get the Kemper brand new and that is a Mesa Boogie Road King (I chose the one denoted 5) and having a Road King in the same room allows me to compare sounds out of 4 x 12 cabs for both amps. Those sounds were near enough the same, but with a couple of changes to the input (re clean and or distorted mix) and a small adjustment of the tone stack in the Kemper, there I was with something that in total has cost less than HALF the price of a Mesa Boogie Road King II head alone here in the UK. The USA boys will get the Mesa cheaper, but it's still an awesome achievement no matter how you look at it and still a massive saving.So as portability is important to many guys, remember I could have used a 1U PA amp (really light even in a 1U or 2U rack) and a 2x12 stereo cab which are around out there. 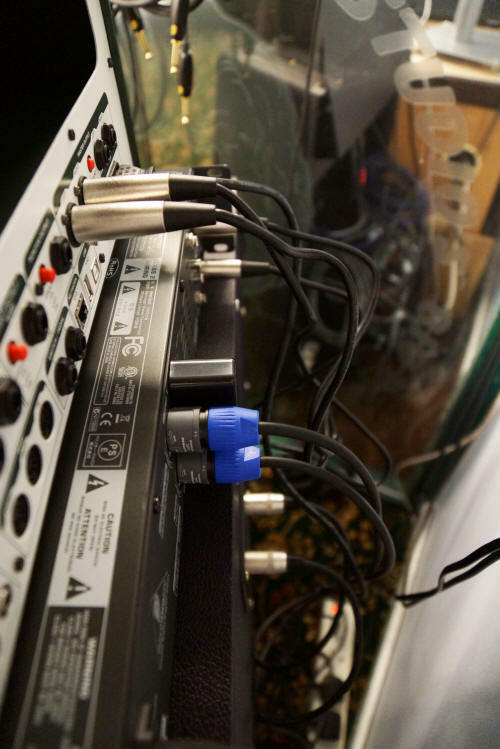 It seems that no matter where or how you use the Kemper Profiling Amplifier there is always a simple solution to the interfacing to external equipment. As I write the latest update on the Kemper power amp for the Kemper Preamp is that the power amp may or may not be an option on V1 (which was reviewed here) and there are images of a 'black' Kemper preamp (but still with the 'green' surround) which looks cool and I know many guys will like that. There's also talk of a Kemper foot controller (I'm not particularly surprised) to control everything on the amp which I'll review should it ever appear, as I will the power amp should it be released. But I am trying out a control pedal with many features that could be used on the Kemper and I'll be reporting that back in due course. There have been a number of OS updates and I noticed at the NAMM 2012 show that Kemper had a unit on the stand with the 'performance' option enabled so that option will probably be there presently and for free to all owners of the Kemper amp. Its seems that this Kemper profiling amp will be destined for a bright future by simply out maneuvering any simulator type of device out there right now (some companies are basically under capitalized) and with the manufacturers being around for 15 years plus, it's extremely likely that they have the financial muscle to take this product to it's natural conclusion - the top of the pile of silicon based solutions for guitarists. One last thing, the Kemper profiling amp reached the number one seller for this category at Thomann (who is a leading distro) within about two weeks or so from release. This confirms that units are shipping in numbers and it's likely that the USA will be a target for this product in the very near future. I would like to thank you all for reading this far - and not if you never made it to the end of this awesomely long review. And of course for visiting my website - its been here forever... like me. Now get out there and buy one! Tell em Tony sent You. Since I wrote this review the units are now on at least version three of the firmware and support the Kemper floor interface (the remote). The interface is exactly what you might expect with just one real addition of a looper, but for only around 30 seconds or so give or take. Personally I don't think the floor controller is worth the cost because of the looper. The advantage to me was that you can just plug in the controller and within minutes its all working - if a tad expensive. I later sold this 'geeks handbag' from Kemper and bought a rack which they released about a year in from the original device. 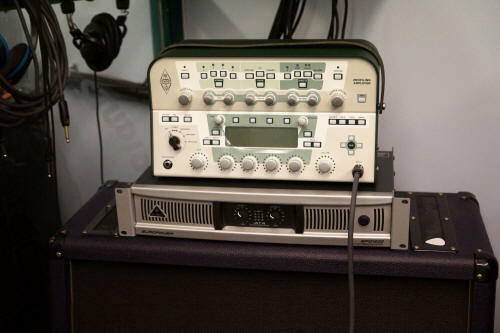 The rack like this unit on demo had no power amp; Kemper in their wisdom later released both units with a power amp inside. However, I bought the necessary parts from another company and proceeded to hack away at my rack until I had a powered rack unit which I still have and it works perfectly. My rack power amp is 90 watts each side and stereo; it can work with or without the amp as I installed it. That modification is available to be seen on this website just look for it under the menu from the top of the page. Please do feel free to link to this review but do not take images or text without my written approval.